What is it about pancakes that makes them just so popular? Whenever I announce to my brood that pancakes are on the menu, there are always shrieks of excitement. They don’t seem to care either what the pancakes are made from, so if you’re finding it tricky to get certain foodstuffs, such as beetroot, into your youngsters, pancakes could be the ideal way to sneak it past them. These pancakes are made from beetroot and carrot, although I’m sure if you did a blind taste test no-one would be able to guess. They simply taste good in a savoury, wholesome kind of way. I was rather hopeful the final pancakes would be pink like the batter. My girls would have loved that. But unfortunately the colour changed as the pancakes fried. Perhaps if you use only beetroot you end up with a stronger colour? I need to experiment some more, I think. I came up with these pancakes as my entry for this month’s Recipes for Life challenge. The three set ingredients for March, you see, are beetroot, carrot and cheese. So the beetroot and carrot are in the pancakes, while the cheese comes in the form of Italian mascarpone cheese combined with Greek yoghurt, lemon juice and lots of fresh herbs for a very delicious topping. I’m running the Recipes for Life challenge in partnership with Somerset charity SWALLOW which works with adult with learning difficulties. Over a six month period we’re challenging food bloggers to come up with a whole host of tasty, healthy and easy-to-cook dishes and the best of these will appear in a new cookbook to raise money for the charity. So if you have your own ideas of what to cook with beetroot, carrot and cheese why don’t you get involved? For the pancake batter, put the flour, beetroot, carrot, bicarbonate of soda and a generous grind of both salt and pepper in a large bowl and mix together well. Gently beat the eggs in a separate bowl and then add the melted butter and milk and mix. Add this to the beetroot and carrot mixture and stir until everything is well combined. Heat a spot of oil in a heavy-based non-stick frying pan. When it’s hot, drop in spoonfuls of the batter and cook your pancakes for a minute on each side. Keep your pancakes warm in the oven until you’ve worked through all the batter. To make the herby topping, simply put the mascarpone and yoghurt in a bowl with the lemon juice and throw in the chopped herbs. Mix it all together and season to taste. Serve your pancakes with a good dollop of the herby mascarpone on top. As this dish features lots of lovely fresh herbs, I’m also entering it into Lavender & Lovage’s Herbs on Saturday blog challenge, which this month is being hosted by London Busy Body. Lots of lovely recipes featuring herbs as a star ingredient have already been entered, so do take a look. I’m sure you’ll be inspired! I’m also entering it into Turquoise Lemons’ fantastic No Waste Food Challenge where food bloggers are asked to share recipes using a particular ingredient in a bid to prevent food waste. This month the challenge is hosted by Elizabeth’s Kitchen. Do pop over and take a look. A great resource if you’ve got lots of eggs to use up! 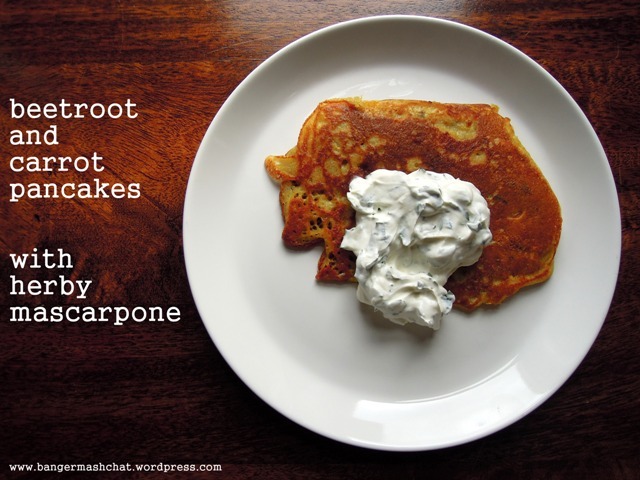 And finally as beetroot and carrot are both in season, I’m entering the pancakes into this Fabulicious Food’s Simple and in Season challenge, which this month is being hosted by my fantastic Food Blogger Connect buddy Chez Foti. And thanks for entering Simple and in Season too, a perfectly scrumptious entry! These look beautiful. I wonder how they’d taste with creme fraiche- my favorite of the creamy spreads. Thanks Eliza. I think creme fraiche would be absolutely perfect too. 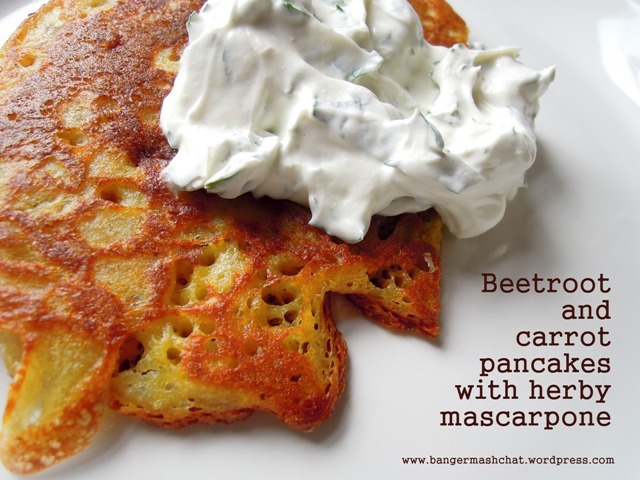 Pancakes are a big favourite here – and these will make a delicious change from my usual savoury version. The herby mascarpone sounds like a great addition too! I love the sound of these – what a great way to sneak some veggies into a reluctant vegetable eater! Thank you for entering them into the No Waste Food Challenge. These look SO good! I think i could whip these up & those veggies would go unnoticed! Whoop! I’ve been thinking hard about what I could make to join in, but i keep drawing a blank 😦 Maybe next month?! These sound great! 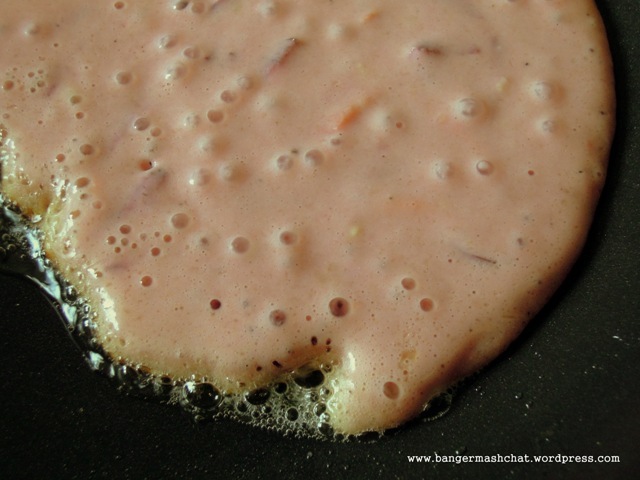 I love the idea of adding veg to a pancake, something Ive never tried before – great inspiration here!